« The Greener Grass we are seeking…. This entry was posted on April 29, 2007 at 10.34	and is filed under Art, Change, Creativity, Imagination, Journeys, Lifes Stories, Mind Power, Prosperity, Spirituality, The Art of Change, The Artists Way, The Law of Attraction, Transformation, Wisdom, Writing. You can follow any responses to this entry through the RSS 2.0 feed. You can leave a response, or trackback from your own site. I have this on tape from the library and it was the greatest help to me and my husband. We listened and will again check it out as soon as it is available. Good schnoogins. 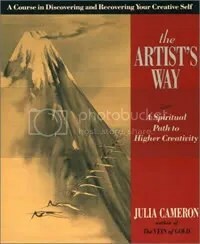 I have never tried “The Artists Way” because–in writing–I am comfortable with the angels and daemons sitting with me at my desk. I see the intent of it, though, and like the way you have summarized it here. Sooner or later, I may open that book. Until then, I’m going to dance with the anima I brought. Just thought I’d say something… I knew Carol at the time she “did” the Artists Way… and I acknowledge that I admired and respected her commitment and discipline at the time (though she may not have known how much so) … and as far as I recall, the process involved did make a difference for her…. a big difference… there are few these days that are willing, let alone enabled, to commit to “learning” or “spiritual” disciplines and regularity, and complete … at that time Carol was and did… and I was impressed. Yes-what a book, forces you to face yourself, regardless, day after day! This book was gifted to me 1995 by a costume designer that I had been working for through a “welfare reform” program after she had seen my illustrations. Two years later I was in college studying set and costume designs and fell in love with theatre. Today I am working illustrating children’s books…yet to be published. Someday I intend to travel to Australia. Perhaps we will meet. The political abuse, neglect of Aboriginal, so much like the Indigenous American Indian and African American here in the US. So much to take in. So much to do. Wow. No matter how many years you spend studying the law of attraction (I’ve been doing that since before it was collectively refered to as the Law of Attraction), you have never seen it all.